Simon is a highly competitive, status-conscious go-getter. His wife Robyn is interested in restarting her successful architect business. Jason Bateman and Rebecca Hall are the Callums, a well-to-do couple who have recently moved from Chicago to suburban Los Angeles. They’ve bought a sleek glass-walled home in the hills near where Simon grew up. They seemingly have the perfect life. However a recent miscarriage hangs over them. Then one day while out shopping for furniture for their new home, a man approaches Simon and claims to know him from high school. Simon doesn’t recognize him until he says his name is Gordon Mosely, or Gordo. Their exchange is pleasant, but soon after, he begins dropping by their home unannounced, usually when Simon is at work. Then there’s the series of escalating presents that Gordo bestows on the pair: a bottle of wine, koi fish for their outdoor pond. His presence starts to make them uncomfortable. Dismantling the peaceful tranquility of the wealthy suburban upper-class is a genre unto itself. Call it the “home-invasion” thriller. Fatal Attraction, Pacific Heights, The Hand That Rocks the Cradle, Single White Female and Unlawful Entry have all done the broad category justice. The Gift is an impressive addition. The cast is uniformly excellent. I generally consider Jason Bateman to be a comedic actor, but he plays against type occasionally. Once again, he is outstanding in a serious role. Rebecca Hall is his equal as yes, his sympathetic wife. But she’s a complex individual in her own right. They don’t always see eye to eye. Together they must contend with this intruder in their lives. Joel Edgerton (Warrior, The Great Gatsby) strikes the perfect balance between menacing and amiable as Simon’s classmate from the past. Edgerton is also the writer and director. He delivers an extremely self assured directorial debut with this finely crafted feature. 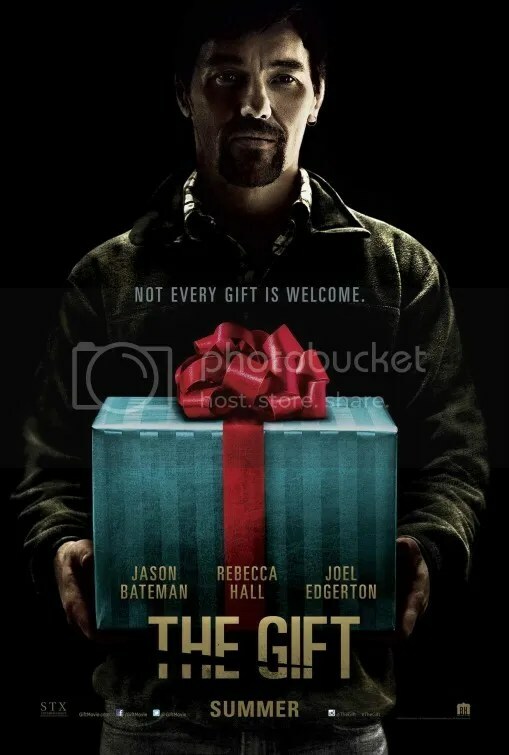 The Gift is a suspense thriller that hews close to the grand tradition of Alfred Hitchcock. The chronicle commences with a predicable frame, but it doesn’t end that way. What energizes the story is how Edgerton’s screenplay extracts tension from the unknown. That queasy feeling you get when things are a bit off kilter but you’re not really quite sure why. That lack of privacy is at the heart of the horror exploited here. Their personal refuge is being infringed to the point that it becomes unsettling. What makes Gordo tick is a question you’ll immediately have once he becomes part of the narrative. The script takes it’s time not to answer this question immediately. The drama allows the audience to simmer for awhile in this sinister stew. I didn’t realize how much I enjoy being on edge. By the shocking climax, The Gift pushes you to the absolute brink. This entry was posted on August 22, 2015 at 9:53 am and is filed under Drama, Mystery, Thriller with tags 2015. You can follow any responses to this entry through the RSS 2.0 feed. You can leave a response, or trackback from your own site. I saw this the week it opened and have still been meaning to write a review for it (same with M:I-5 and Straight Outta Compton). Didn’t like this nearly as much as you did, though. I thought it was full of clichés and the character development really threw me off. Plus there were a lot of plot points that didn’t even need to be there in the first place. Good acting, though. I’d give it like a 2.5/5. Oh and I actually thought the climax was rather predictable. The climax was just the icing on a malevolent cake. It wasn’t just about the finish. The dread kept expanding throughout the film. A slow burn thriller as they say. Horror has really stepped up its game. I must add this to my ‘Must See Immediately’ list. I did use the word “horror” in my review but it’s not really part of that genre per se. It’s more psychological thriller than anything else. I agree. I liked it, as well. Lot of tension and wasn’t predictable. The finale wasn’t as shocking as I was hoping, like in “Orphan” but it fit the story; and this is one of those that you like it more, the more you think about it after you leave the theater. I think this is the first film I saw at the theater since Mad Max. Nothing this summer has interested me. This is the only film to do so this season. Speaking of thriller, you haven’t been to my blog in a while. I’ve only posted 2 entries the last couple months, but you need to go on there and check out my “Creep” entry (my second-to-last entry). I thought it was a decent summer. Besdies the 2 mentioned, I also really enjoyed Inside Out & Me and Earl and the Dying Girl. I’m amazed at how great this was. I wasn’t impressed with The Rover (he wrote that) but this made me a fan of his work behind the camera. The script did such a great job at creating tension. Oh wow. 4 1/2 stars from you too. Nice. Loved it as much as you did. The way it flips genre conventions about a third of the way through was unexpected. I also thought this was highly unpredictable. Trailer made the film seem generic, but in this case, I think it was intentional. It really gives little to nothing away. One of my favorites of the year. A good trailer should present the set-up, but not give any story developments away. I no longer even watch trailers anymore. The great majority give away too amny details that ruin the surprise of watching the film. You’re absolutely right. I hardly ever go out of my way (i.e, YouTube) to view the latest trailer, but I just think it is hard to avoid them in the theater without deliberately coming right before the show starts. I guess I’m more traditional; I like getting to my seat a few minutes before the run of previews begin. I know that some advance screenings don’t show them, which is awesome. Fantastic write-up! I can’t wait to check this one out. Been hearing only great things about Edgerton’s debut behind the camera. Next up, co-starring with Johnny Depp in Black Mass. Already hearing great things about it. Too scary for me. Well made but not my cup of tea you could say. It was creepy to be sure, but I never found it scary. How do you define the difference between creepy and scary? I think everyone has those sensitive spots that really scare them (some scared of heights, others snakes, others being alone etc). For me it is anything with women being raped, murdered or stalked. I agree that The Gift is an impressive addition to the “home invasion” thriller genre and that the cast is uniformly excellent. Bateman is fantastic playing against type and Rebecca Hall gives a complex performance. You’re right that Joel Edgerton strikes the perfect balance between menacing and amiable. His directorial debut is very self-assured and this feature is finely crafted. I love how the film starts out so conventionally and then completely subverts your expectations as it goes on. I also enjoyed how much The Gift kept me on edge. I love when low budget films (a production budget of $5 million in this case) make significantly more than they cost. Box office: $43.8 million. Means we’ll get more gems like this.